Harry Morrison first met Charles Bristow on the Calais boat train. Morrison, at the time, was an agent for the Boscomb Travel Agency, and Bristow was a lawyer. The two men entered into a conversation about travel and they came up with a scheme to buy an older ocean liner, the Helenique, and run her around the British Isles. This would enable people with limited means to enjoy a holiday trip on a ship which they could afford. The two men agreed to look into the financial aspect of this business and get back to discuss it. Sharing the train compartment with them was a man who appeared to be asleep. Morrison noticed from his luggage tag that his name was A. N. Malthus. Their financial investigations showed that the scheme would work, but they would need a backer with money in order to buy the ship. Harry Morrison had had dealings though his travel agency with John M. Stott who was a wealthy man. Stott enjoyed traveling, but he had been just about everywhere, and Morrison thought that he might be interested in the venture and would enjoy having a ship in which he was a part owner, and could have his own deck. Stott became very enthusiastic about it, and agree to put up the money for the ship. Malthus had not been sleeping on the train, and he tried to get the ship first, but Stott figured out a clever way to get the ship for himself, Morrison, and Bristow. Now that Stott was a major partner, he decided on a new purpose for this venture. Instead of a lower price cruise for the middle class, he wanted the ship to be used for a floating casino for the upper classes. The cabins would be refitted to be luxurious. Since British law did not permit such a gambling venture, the gambling rooms would only be open when the ship was outside the three mile limit, and Stott had the ship registered as a French vessel. The ship would now feature both gambling and day trips to scenic spots on the islands, England, and Ireland. Morrison was hired to arrange travel for the customers to and from the ship and was given ten percent of the profits. When the ship had been refitted, the cruises began, and did very, very well. Many people in England did not approve of this gambling venture, and neither did the British government. The government wanted someone on board this ship who would look out to see that everything was done properly, and to look for some way that this venture could be ended. For this purpose, Inspector French was enlisted. He would take a two week cruise on the ship under the name of John Forrester, and he could bring his wife Em along. John Forrester and his wife would arrive on the ship along others who were very important to the story. There was a group which was made up of Major Wyndham Stott, Mrs. Stott who was Wyndham's second wife, Miss Majorie Stott, his daughter, and Mr. Percy Luff, who Mrs Stott's son. The members of this group were very important people since they were relatives of John M. Stott and they would receive VIP treatment. Also on this day, Alex N. Malthus and Clarence Mason arrived. They were the ones who had tried to start this venture before Stott beat them to the punch. John Stott had a strong interest in archaeology and when the ship visited the islands, he either went or sent someone to take photographs of historical sites. When the ship was the neighborhood of the Giant's Causeway, Stott himself went to take photographs, and after he did this, someone murdered him. Now Inspector French had two problems. Scotland Yard wanted him to reveal his true identity and find the murderer, and he still had the task of finding something illegal about the activities of the gambling ship. Inspector French is a man who would not be daunted by difficulty. He is incredibly methodical, and I somehow picture him with an ordnance map in one hand and a schedule of some sort in the other. He will overcame the problem of finding a motive for the crime (nobody seemed to have a good one), and finding someone who did not have an alibi for the time of the murder (all of the suspects seemed to have one). This is an enjoyable book if you like puzzle mysteries with difficult solutions. French is an upright and hardworking policeman which does not make him a very exciting detective. I do wish that his wife had been given a bit more to do in the book since she was along on the trip. This book was published in 1939. It has been reissued by the Langtail Press in print and as an e-book. 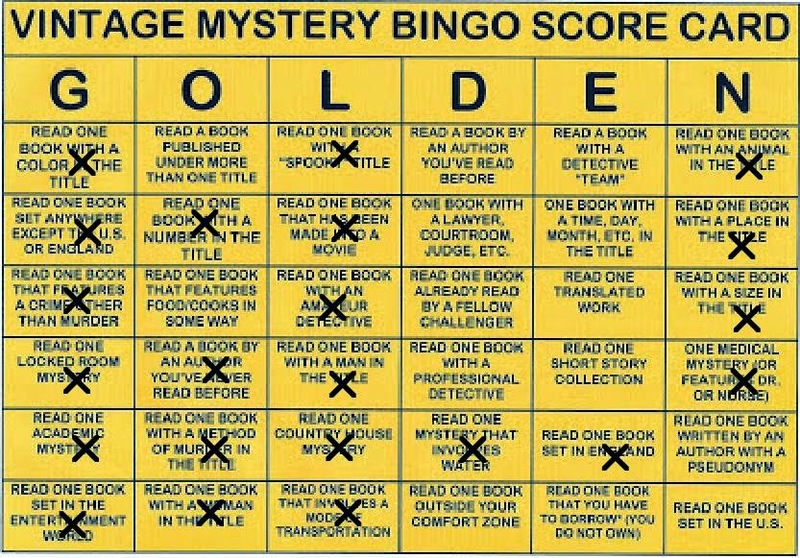 I have read this book for the Vintage Mystery Challenge in the category of a mystery which involves water.